In vitro modelling is an attractive alternative to the use of animals in research. In vitro experiments are less expensive, can be carried out without a home office licence and human cells can be used for models of human diseases. However in vitro models are often oversimplified and lack the correct environment to accurately reflect the in vivo state. One way to improve the physiological relevance of in vitro models is the addition of flow. This article summarises in vitro models of the blood-brain barrier and a simple method for adding flow. The brain is the most complex organ of the human body comprising billions of cells and trillions of connections1. It controls every conscious thought and action as well as fundamental body functions such as breathing and heart rate. In fact all sensory impulses, except the most basic of reflexes, are processed by the brain. Due to its vital importance, the brain is afforded several features to protect it from damage. The most obvious is the skull that encases the brain and provides a very tough physical barrier to injury. In addition to the skull the brain is also covered in three protective membranes called the meninges and is bathed in fluid (known as cerebrospinal fluid or CSF) that allows the brain to float (see fig 1), providing further defence against physical injury and reducing the weight of the brain. The cortex of the brain has many layers of protection to shield it from physical injury. The scalp and skull offer the first physical barriers providing a very tough defence against physical force. 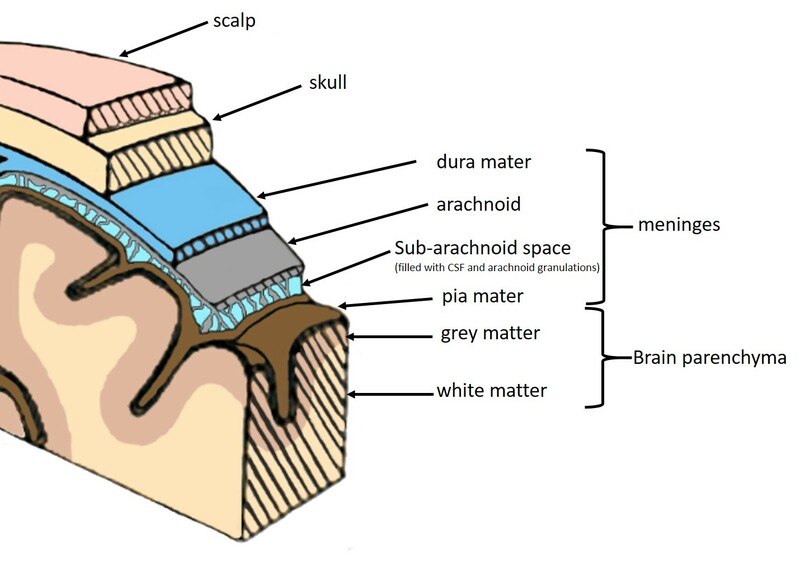 The meninges also help to shield the brain from trauma and the fluid-filled spaces between the meninges give the brain buoyancy, reducing its overall weight and softening any impact against the skull when the head suffers trauma. A further protective element of the brain is the blood-brain barrier (BBB). This barrier separates the brain tissue from the circulating blood and tightly controls the passage of ions, molecules and cells between the blood and brain parenchyma, therefore providing a defence against any blood-borne pathogens or toxins that may cause harm to the neural network. The BBB is composed of a tightly sealed monolayer of endothelial cells. Unlike the fenestrated capillaries found elsewhere in the body, the gaps between cerebral microvascular endothelial cells are sealed by tight junctions and permeability is limited by the expression of tight junction proteins such as claudins, occludins and zonular occludens2,3. Although the endothelium is responsible for tight junction formation, there is also an extensive network of supporting cells that are central to the maintenance and integrity of the BBB. There is strong evidence that mural cells, known as pericytes, embedded in the basement membrane of endothelial cells4 actively regulate BBB integrity5,6 and regulate tight junction permeability7. Tight junction formation in endothelial cells has also been shown to be heavily dependent on secretions from astrocytes8-10. The in vivo arrangement of these cells is summarised in fig 2. The smallest of the cerebral blood vessels, the lumen of a capillary is formed by a layer of endothelial cells joined by tight junctions; this is the site of the BBB. These endothelial cells produce a basement membrane that communicates with the basement membrane of the astrocytes whose end feet are in contact with the vessel wall. 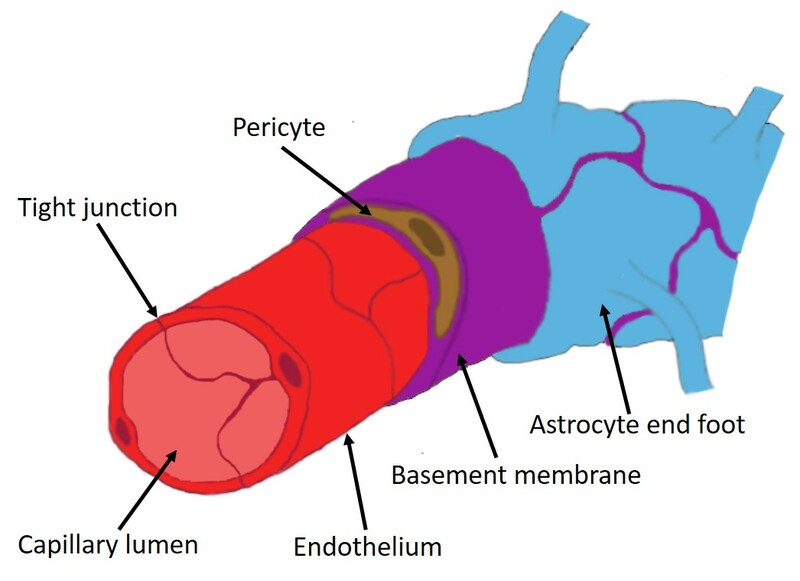 Encased within the basement membrane are the perivascular cells known as pericytes. Unfortunately the BBB offers a real challenge when it comes to treating mental and neurological diseases as most potential drug treatments are unable to cross the BBB and are thus rendered ineffective. It is estimated that 98% of small molecules and 100% of large-molecule neurotherapeutics are excluded from the brain by the BBB11. Studying the properties of this barrier can aid in understanding how it functions and many in vitro models of the BBB have been developed for the purpose of testing a drugs ability to cross the BBB. As our understanding of the BBB has increased so has the complexity of in vitro models. Early in vitro models of the BBB involved growing monolayers of endothelial cells. As the role of astrocytes became clearer, cultures using astrocyte conditioned medium and eventually co-cultures of astrocytes and endothelial cells were developed using Transwells12. When pericytes and their role in BBB maintenance was discovered these too were included in modelling. The final result is a triple culture utilising all the key cellular elements of the BBB. A summary of in vitro BBB models is shown in fig 3. These multi-cell models show vast improvement over monolayer cultures with higher trans-endothelial resistance and reduced permeability13,14 and is a widely accepted in vitro model of the BBB adopted by many groups15-20. However these traditional approaches to in vitro modelling do not adequately mimic the dynamic environment that the BBB is subjected to in vivo. There are 3 major fluids that circulate in the brain: blood, cerebrospinal fluid (CSF) and interstitial fluid (ISF) and the BBB is subject to the forces exerted by the flow of these fluids. The biggest influence on the endothelium comes from the blood. The blood flow-created shear forces are needed for mature tight junction formation21 and it has been shown that shear-induced stress significantly upregulates tight and adherens junction proteins in vitro22,23. To address the limitations of traditional in vitro BBB models there have been several attempts to develop microfluidic-based BBB models23-31. Typically these microfluidic chips contain 2 channels, separated by a polycarbonate porous membrane, similar to that of a Transwell; these channels allow dynamic flow and generate shear stress on the cell layers. Although a more accurate BBB model, when compared to static equivalents, the use of microfluidics chips is not without its disadvantages. Perhaps the largest drawback is the level of modification required to migrate from the triple culture model, adopted by many groups, to a microfluidics system. 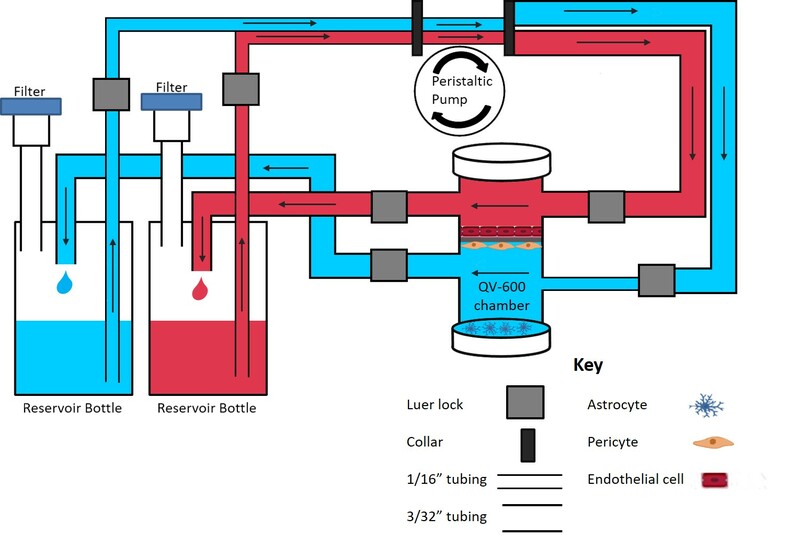 To address this problem Kirkstall have developed a double cavity bioreactor chamber, known as the QV600. Capable of accommodating a 24-well insert, the QV600 is a quick and easy way to incorporate physiological flow to a well-established multi culture model of the BBB. It is also straightforward to compare results with previously obtained data from static conditions as the scale is the same (same number of cells, same timeframe etc)32. With 2 independent inlet and outlet tubes the system can support 2 different media and 2 different flow rates if applicable so could be used to incorporate the flow of CSF or ISF in addition to blood flow, further increasing the physiological relevance. An example of the setup is illustrated in fig 4. A) A monolayer culture of endothelial cells. Conditioned medium may be used to increase the barrier integrity in monolayer cultures. B) An indirect co-culture of endothelial cells and astrocytes. C) a direct co-culture of endothelial cells and astrocytes. D) A triple culture with endothelial cells in the apical surface of the Transwell, pericytes on the basolateral surface and astrocytes on the base of the well. Accurate in vitro models are necessary for understanding how the BBB forms and functions. Using the QV600 system to introduce flow to existing multi-cell culture models will improve the physiological relevance and should more accurately mimic in vivo conditions making it a useful tool for studying the BBB and drug permeability of neurotherapeutics. Azevedo FA, Carvalho LR, Grinberg LT, et al. Equal numbers of neuronal and nonneuronal cells make the human brain an isometrically scaled-up primate brain. J Comp Neurol 2009;513(5):532-41. Farquhar MG, Palade GE. Junctional complexes in various epithelia. J Cell Biol 1963;17:375-412. Bauer H-C, Krizbai IA, Bauer H, et al. “You Shall Not Pass”—tight junctions of the blood brain barrier. Frontiers in Neuroscience 2014;8:392. Sá-Pereira I, Brites D, Brito MA. Neurovascular Unit: a Focus on Pericytes. Molecular Neurobiology 2012;45(2):327-47. Armulik A, Genove G, Mae M, et al. Pericytes regulate the blood-brain barrier. Nature 2010;468(7323):557-61. Dente CJ, Steffes CP, Speyer C, et al. Pericytes augment the capillary barrier in in vitro cocultures. J Surg Res 2001;97(1):85-91. Dohgu S, Takata F, Yamauchi A, et al. Brain pericytes contribute to the induction and up-regulation of blood-brain barrier functions through transforming growth factor-beta production. Brain Res 2005;1038(2):208-15. Yousif LF, Di Russo J, Sorokin L. Laminin isoforms in endothelial and perivascular basement membranes. Cell Adh Migr 2013;7(1):101-10. Abbott NJ. Astrocyte-endothelial interactions and blood-brain barrier permeability. J Anat 2002;200(6):629-38. Arthur FE, Shivers RR, Bowman PD. Astrocyte-mediated induction of tight junctions in brain capillary endothelium: an efficient in vitro model. Brain Res 1987;433(1):155-9. Pardridge WM. The Blood-Brain Barrier: Bottleneck in Brain Drug Development. NeuroRx 2005;2(1):3-14. Wang Y, Wang N, Cai B, et al. In vitro model of the blood-brain barrier established by co-culture of primary cerebral microvascular endothelial and astrocyte cells. Neural Regen Res 2015;10(12):2011-7. Nakagawa S, Deli MA, Kawaguchi H, et al. A new blood-brain barrier model using primary rat brain endothelial cells, pericytes and astrocytes. Neurochem Int 2009;54(3-4):253-63. Nakagawa S, Deli MA, Nakao S, et al. Pericytes from brain microvessels strengthen the barrier integrity in primary cultures of rat brain endothelial cells. Cell Mol Neurobiol 2007;27(6):687-94. Hellinger E, Veszelka S, Toth AE, et al. Comparison of brain capillary endothelial cell-based and epithelial (MDCK-MDR1, Caco-2, and VB-Caco-2) cell-based surrogate blood-brain barrier penetration models. Eur J Pharm Biopharm 2012;82(2):340-51. Imamura S, Tabuchi M, Kushida H, et al. The blood-brain barrier permeability of geissoschizine methyl ether in Uncaria hook, a galenical constituent of the traditional Japanese medicine yokukansan. Cell Mol Neurobiol 2011;31(5):787-93. Ceruti S, Colombo L, Magni G, et al. Oxygen-glucose deprivation increases the enzymatic activity and the microvesicle-mediated release of ectonucleotidases in the cells composing the blood-brain barrier. Neurochem Int 2011;59(2):259-71. Veszelka S, Toth AE, Walter FR, et al. Docosahexaenoic acid reduces amyloid-beta induced toxicity in cells of the neurovascular unit. J Alzheimers Dis 2013;36(3):487-501. Toyoda K, Tanaka K, Nakagawa S, et al. Initial contact of glioblastoma cells with existing normal brain endothelial cells strengthen the barrier function via fibroblast growth factor 2 secretion: a new in vitro blood-brain barrier model. Cell Mol Neurobiol 2013;33(4):489-501. Lukic-Panin V, Deguchi K, Yamashita T, et al. Free radical scavenger edaravone administration protects against tissue plasminogen activator induced oxidative stress and blood brain barrier damage. Curr Neurovasc Res 2010;7(4):319-29. Tarbell JM. Shear stress and the endothelial transport barrier. Cardiovasc Res 2010;87(2):320-30. Cucullo L, Hossain M, Puvenna V, et al. The role of shear stress in Blood-Brain Barrier endothelial physiology. BMC Neurosci 2011;12:40. Griep LM, Wolbers F, de Wagenaar B, et al. BBB on chip: microfluidic platform to mechanically and biochemically modulate blood-brain barrier function. Biomed Microdevices 2013;15(1):145-50. Booth R, Kim H. Characterization of a microfluidic in vitro model of the blood-brain barrier (muBBB). Lab Chip 2012;12(10):1784-92.
van der Helm MW, van der Meer AD, Eijkel JC, et al. Microfluidic organ-on-chip technology for blood-brain barrier research. Tissue Barriers 2016;4(1):e1142493. Prabhakarpandian B, Shen MC, Nichols JB, et al. SyM-BBB: a microfluidic Blood Brain Barrier model. Lab Chip 2013;13(6):1093-101. Brown JA, Pensabene V, Markov DA, et al. Recreating blood-brain barrier physiology and structure on chip: A novel neurovascular microfluidic bioreactor. Biomicrofluidics 2015;9(5):054124.
van der Meer AD, Orlova VV, ten Dijke P, et al. Three-dimensional co-cultures of human endothelial cells and embryonic stem cell-derived pericytes inside a microfluidic device. Lab Chip 2013;13(18):3562-8. Wang JD, Khafagy el S, Khanafer K, et al. Organization of Endothelial Cells, Pericytes, and Astrocytes into a 3D Microfluidic in Vitro Model of the Blood-Brain Barrier. Mol Pharm 2016;13(3):895-906. Adriani G, Ma D, Pavesi A, et al. Modeling the Blood-Brain Barrier in a 3D triple co-culture microfluidic system. Conf Proc IEEE Eng Med Biol Soc 2015;2015:338-41. Herland A, van der Meer AD, FitzGerald EA, et al. Distinct Contributions of Astrocytes and Pericytes to Neuroinflammation Identified in a 3D Human Blood-Brain Barrier on a Chip. PLoS One 2016;11(3):e0150360. Giusti S, Sbrana T, La Marca M, et al. A novel dual-flow bioreactor simulates increased fluorescein permeability in epithelial tissue barriers. Biotechnol J 2014;9(9):1175-84.